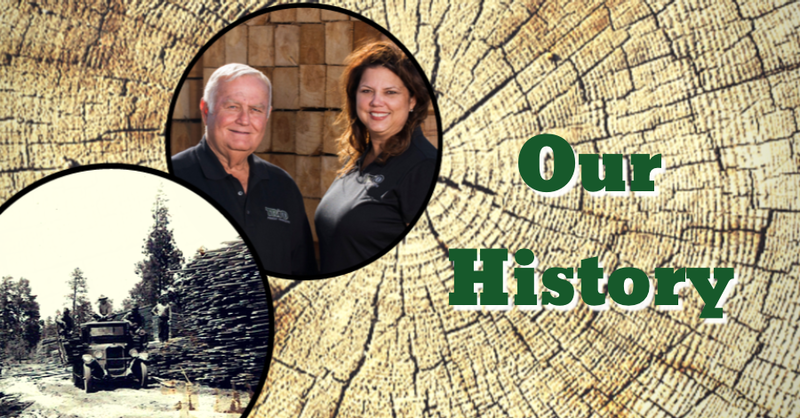 Our History | Trio Forest Products, Inc.
Trio Forest Products Inc. opened it’s doors in 1979, over three decades ago…but the bloodlines of the Lumber industry runs all the way back to Jerry Lilly’s grandfather. The photo above was taken in the early 1900’s of Jerry Lilly’s grandfather’s lumber yard in Northern Arizona (Fish Sawmill). While Trio Forest Products Inc. may not existed back then the passion for the Lumber industry certainly did and it was passed down from one generation to the next. Today, Trio Forest Products Inc. is ran by Jerry Lilly and Tina South a father and daughter partnership that is nothing shy of a “dynamic duo”. Jerry remembers working in the lumber yard at an early age of 10 years and Tina followed suit. Both Jerry and Tina learned the industry “the right way” (as Jerry states); “by working”. “We learned by doing”, both Jerry and Tina worked every position there was to work to learn everything they could. Tina said, “I remember coming to the yard when I was about 12 years old; I would stack wood for hours and by the time I was 16 I was able to come into the office and start learning there”. The passion and hardworking ethics are not the only things these two have in common; both of them are two of the most humble people you will meet. They both give credit to “the family” as being the reason for Trio still being around. “The family” being the team of people that they work with everyday. Both Jerry and Tina stated “we may not be perfect all the time but we sure do have a great group of caring people that do their best everyday and work hard to make Trio what it is”. The last recession took it’s toll on the industry, many yards were forced to close. When things were “really good” the industry focused on systems rather than the customer…Trio never changed. When asked why they felt Trio was able to make it through they said “because we have always had the attitude that we will put the needs of the customer first”. “We focused on what the customer wanted: service, good price, available inventory, and support”.